We offer 10 courses on free open source information sharing tools. In our first course, learn how to use Linux & LibreOffice to create web building documents! Our second course, Learn HTML and CSS, reviews important foundational skills for building basic websites. Our third course – Create Your Own Interactive Website - shows you how to create an interactive website with Joomla, the world's most powerful web building platform! Our fifth course, Create Your Own Community Network, combines several free tools to form the ultimate online organizing platform! Our sixth course, Create Your Own Video Channel, shows you how to create your own channel with free open source video production tools! Our seventh course, Create Your Own Online Store, shows you how to build an online store with VirtueMart - a free open source Ecommerce web building tool! Our eighth course, Create Your Own Online Course, shows you how to build online courses with Moodle, the world's most popular free course building tool! In our ninth course, Create and Publish Your Own Book, learn how to use Libre Writer to create your own book! In our tenth course, we explain how to create your own Linux Server to host your own websites. 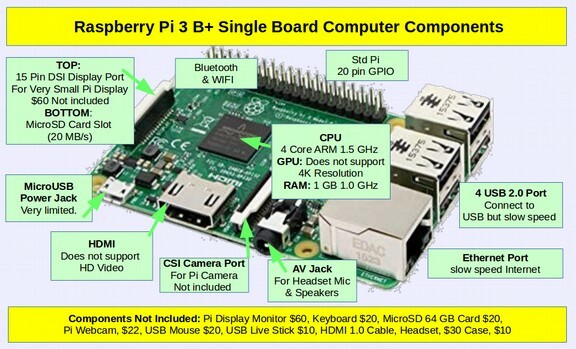 Low Cost Single Board Computers (SBC) have become very popular thanks to the Raspberry Pi – a very small $35 SBC that has sold over 12 million units in the past 6 years. One of the many uses for Single Board Computers is to help students learn how computers work. In reality, these tiny circuit boards are not very useful without being attached to a monitor and keyboard. Adding even a cheap used monitor and key board to the Pi Circuit board will add another $80 to the price of the Raspberry Pi. In this article, we will look at three lowest cost options for using Single Board Computers. 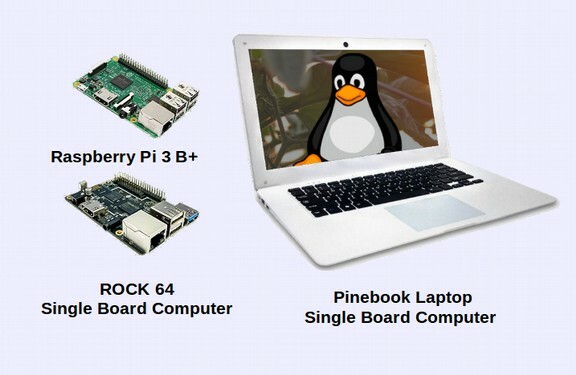 These options are the Raspberry Pi 3 B Plus, the ROCK 64 SBC – which is a greatly improved version of the Raspberry Pi and the Pinebook – which is an improved version Raspberry Pi which comes inside of a 14 inch laptop. The goal of this article is to show parents and teachers that, when all costs are considered, the Raspberry Pi is not actually the cheapest option for helping students learn about computers. There are several problems with the Pi 3 B+. The biggest is a very limited amount of RAM. RAM is much faster than data stored in permanent memory. 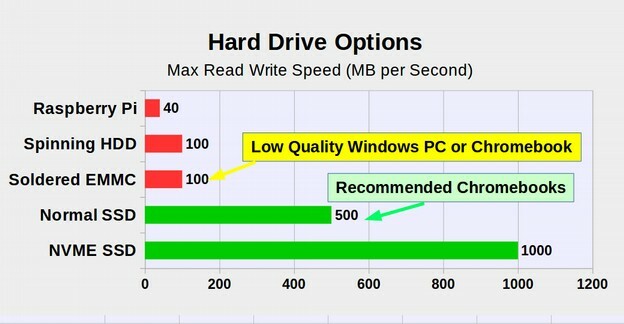 Using modern operating systems and modern applications like book editing, image editing or video editing, it is common to need at least 2 GB of RAM – and 4 GB of RAM is even better to reduce the odds of your computer freezing up or crashing. The ROCK 64 is a more recent Single Board Computer intended to address several of the weaknesses of the Raspberry Pi. The ROCK 64 comes with 4 GB of RAM for $45 – only $10 more than a Raspberry Pi. In addition, the RAM in ROCK 64 is DDR3 which is almost twice as fast as the Pi RAM which is DDR2. The ROCK 64 has several additional important benefits as we describe in more detail below. Basically, the ROCK 64 reduces the most critical Raspberry Pi Data Transfer “bottlenecks” in key components such as the USB and Micro SD connections - resulting in a computer that is on average about 10 times faster and has the power to display a large 4K high resolution TV screen - for a total price that is only a few dollars more than a Raspberry Pi. Access to low cost computers is an important part of preparing students for the information economy of the future. Because a school district may buy hundreds of computers at a time, it is essential to understand the options. For several years, Chromebooks have dominated the school computer market due to their low price ($150 to $300) – about half the price of a comparable Windows computer. Chromebooks have a low price because they use a version of the free Linux operating system. There are less expensive options than Chromebooks. One of these is Raspberry Pi. Initially, Raspberry Pi was just a simple circuit board which cost only $25 – but did not include a monitor or keyboard. Also Pi was slow and had very little memory. It therefore was not suitable for running word processing, image editing or video editing programs. However, recently, a new version of Raspberry Pi, version 3 B Plus, has been introduced which has a faster processor and more Memory (aka RAM) needed to run common programs. Like Chromebooks, Raspberry Pi uses a version of the free Linux operating system. There are now also accessories or kits which can be added to Raspberry Pis to make them more functional. These accessories include monitors, keyboards, battery packs and web cams (all of which come included with Chromebooks). These accessories bring the price of the Raspberry Pi 3 B Plus up to about $200. 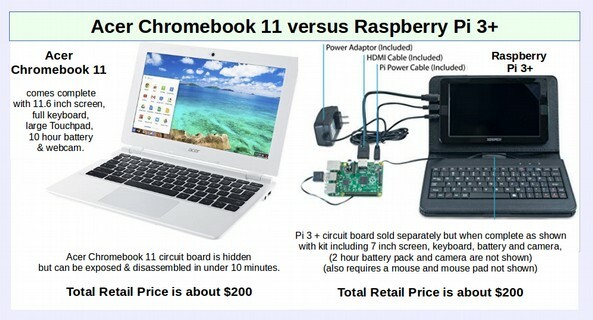 Since this is also the price of the Acer Chromebook 11, in this article we will compare the Raspberry Pi 3 to the Acer Chromebook 11 and provide several other low cost computer options to help parents, students, teachers and school administrators better understand the trade-offs between these two low cost school computer options. First, it is important to note that both the Acer Chromebook 11 and Raspberry Pi 3 B Plus require some work to make them fully functional. Welcome to College in the Clouds! Welcome to College in the Clouds! Our mission is to help you learn how to build your own interactive website. Our goal is to revolutionize the way books are written, websites are built, online businesses are run and online courses are taught by introducing you to a new generation of free open source web building tools. We offer a 10 book, 10 part series on free tools for sharing knowledge. In our courses, books and videos, you will learn how to use several open source web building tools, including the free Linux operating system, LibreOffice for creating Books and Ebooks, Joomla for website management, Community Builder for online organizing, VirtueMart for Ecommerce and Moodle for Elearning. Open source means the source code, or software, is free and can be shared by anyone with anyone for any purpose. Open source is like a library...free and open knowledge shared with the community for the common good. No patents, no hassles, no barriers, no limits! We offer 10 different courses on using free open source information sharing tools. There is an online revolution occurring in the world today. Businesses are increasingly selling their products and services online. Educational organizations are teaching courses online. Social organizations are building their communities online. The latest news is being transmitted online. Authors are selling their books online. Families are shopping online. The sharing of knowledge and ideas is increasingly occurring online. If you want your business to succeed, it is time to join this revolution. There is another online revolution occurring at the same time. Web 1.0 brought the Internet to the entire world. But folks could only look at websites. They could not interact with them. Web 2.0 allowed folks to interact with websites by clicking on buttons and filling out forms. But you still needed to learn computer programming if you want to have full control over your own website. With our books and courses, we are introducing Web 3.0 – full control over the appearance, content and function of your website – without computer programming – simply by clicking on a series of buttons! With our courses, you will be able to create your own interactive website to bring in new customers now and expand to accommodate growth in the future. We begin by learning how to install a free open source operating system called Linux Mint onto your computer. Linux Mint comes with over 60,000 free tools for managing documents, images and videos. One of the most important of these free tools is Libre Office – a free Word Processing tool that is idea for optimizing images and creating documents that can easily be transferred to our website. While Libre Office is available for Windows and Apple computers, it works best on the free Linux operating system. Thankfully, nearly any old computer you have can be easily turned into a Linux computer. Our second course reviews important foundational skills for building websites as well as how to create colorful website feature boxes and email newsletters. In our third course, Create Your Own Interactive Website, we cover how to use Joomla – the world’s most powerful web building platform, to build an interactive website. Thanks to recent developments in Joomla extensions and templates, it is now possible for you to have complete control over the content, appearance and function of your website – and build an interactive website without learning any computer programming. Many of the techniques we advocate in our books and courses have never been covered in any previous book or course on web building. If you have struggled to build an interactive website in the past, you will be amazed at how much easier this process has become. In our fourth course, we will explain how to add several more free Joomla tools to turn your website into an online regional, national or international news organization. In our fifth course, we will show you how to install free Joomla online organizational building tools such as Community Builder for creating a membership interaction network, Kunena Forum for creating a topic based discussion board, AcyMailing for free customized newsletters and ICAgenda for organizing community events. In our sixth course, Create Your Own Video Channel, we show you how to set up your own video network combining free open source video production tools with a free You Tube Channel. In our seventh course, , Create Your Own Online Store, we explain how to use a free Joomla tool called VirtueMart to set up an online store and Akeeba Subscriptions to set up an online club membership system. In our eighth course, Create Your Own Online Course, we show you how to set up your own online educational program using a free open source course creation program called Moodle which can be integrated with our Joomla website. In fact, the 8 to 10 categories on each of our Joomla website are intended to be converted into an 8 to 10 week course. Our goal in sharing knowledge is to combine the power of a Joomla website with an Ebook and a Moodle course for a complete knowledge sharing process! In our ninth course, we describe how to use free open source tools such as LibreOffice and Sigil to create a book and post it onto online retailers through IngramSpark. There is a very close relationship between a website and an Ebook. Both are ways of sharing knowledge in an organized manner. Because Joomla helps you organize your ideas by assigning articles to categories, it is easy to turn these categories into chapters of your book. So as you write pages for your website, you are also creating the foundation for your Book and Ebook. Joomla also helps you turn your book into a website to help promote your book. We show you how to tie these knowledge sharing tools together. Our primary goal is to introduce you to new tools and techniques that can help you build your own interactive website. However, we also hope to change the way Joomla is taught, and ultimately change the way websites are built. Our goals include offering you a new and radically different way to learn Joomla and build your website. To achieve these goals, in our books and courses, we offers several innovative features. The first thing you will notice about our books and courses is the huge number of images. Each of our courses feature hundreds of images showing exactly how to perform various tasks. Images are useful in helping you see what the screens should look like when you are building your own website. These images are also intended to promote multimodal learning. While some students learn best by reading words, others learn by looking at images. A second difference between our books and courses compared to traditional web building books and courses is that we demonstrate not only Joomla, but also how to add and use extra tools called extensions to your website. Joomla by itself will not produce an interactive business website. The main power of Joomla comes from the thousands of free add-ons which are available on the Joomla extension directory. We provide detailed instructions on how to install and use dozens of important Joomla extensions. We offer seven ways to learn how to use free open source web building tools. First, visit our eight course websites and click through the pages. Each of our eight free course websites have about 40 articles on how to use open source tools to build your business website. These websites provide many examples of the finished pages in addition to step by step instructions on how to create those pages. The website for our second course is learnhtmlandcss.com. The website for our ninth courses is createandpublishyourownbook.com. The website for our tenth course is createyourownlinuxserver.com. Second, buy our Ebooks and read on your portable reader. All of our course books can be purchased as PDF books at a link provided on our websites. They can also be purchased as Ebooks through Barnes and Noble for reading on an Ebook Readers. The cost of these Ebooks is $10 each. Third, buy our course books and read even when you are not near a computer. All of our course books can also be bought as print books at a link provided on our website or through Amazon.com. These reference books can be a great aid to keep beside your computer and refer to as you are building your own interactive website. The cost of our Black and White Print Books is $20 each plus $5 shipping. Our full color books are $40 each plus $5 shipping. Fourth, watch our free course videos on our College in the Clouds You Tube Channel. Each of our courses has its own Youtube channel where beginning in the Spring of 2019, you can watch free videos of concepts discussed in our courses. Each video will be about 10 to 15 minutes in length and demonstrate how to perform many of the tasks described in the associated chapter of our courses. Fifth, ask questions on our course forums here at College in the Clouds. Just click on the menu item called Course Forums. Our course forum is divided into the same 10 courses as our websites and books. Go to the forum to read questions from others. To post your own question, register for the forum, then find the select the best section to place your forum and then click on the “New Topic” button. Sixth, sign up for our free newsletter – also at collegeintheclouds.org to receive updated information on how to build a Joomla website. Seventh, sign up for one or more of our interactive online courses! We offer three levels of comprehensive individualized courses. In each course, we work directly with you to design and build your own interactive Joomla website. Each of these three courses includes a fully built Joomla website, domain name, web hosting and a full year of individualized instruction on how to use all the tools that come with your interactive Joomla website. Our first “foundational” course on how to create an Interactive Joomla website (Bronze Club Membership) is $1,000. Our second year long comprehensive course, includes one on one instruction in our Joomla foundational course PLUS any one of our nine other courses to expand your Joomla website into a more complete knowledge sharing platform. This course, Silver Club Membership, is $2,000. Our third year long comprehensive course includes one on one instruction in all ten of our courses plus two years of individualized instruction on how to use all of the tools that come with these websites. This Gold Club Membership is $3,000. To sign up for our free email updates and/or to sign up for any of our interactive online courses, click on the Join Now box at College in the Clouds. For additional information, click on “Contact Us” at the top of the page. Welcome to College in the Clouds… Open Minds, Open Hearts, Open Source!